2. 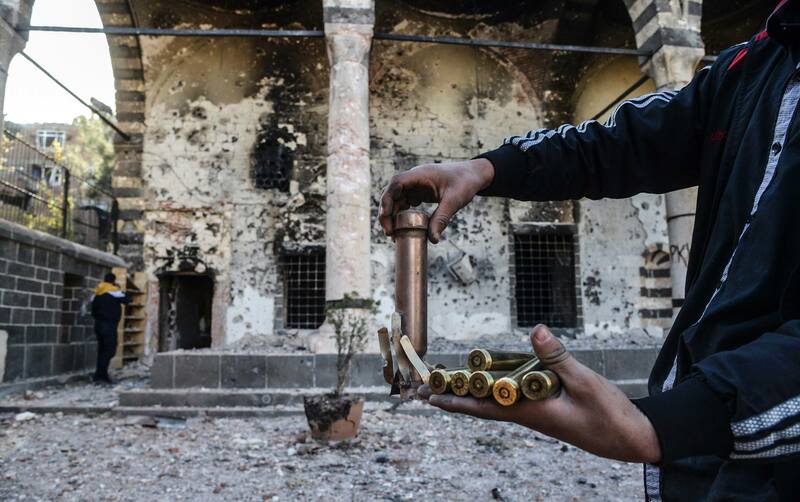 Turkey: Kurds in Mus “working behind the adversary’s lines while still living in their hometown. 3. Round Up of Observations on Turkish Elections June 2018. 1. Public Forum | Permanent Peoples’ Tribunal on Turkey and Kurds: The Verdict Turkey Found Guilty of ‘War Crimes’: Where do we go from here? Kurdistan Worker’s Party (PKK) Executive Committee released a statement marking the sixth anniversary of the July 19 Rojava Revolution. “Today, Rojava and Northern Syria is an oasis of stability and peace based on freedom and democracy, not only in Syria but entire Middle East territory”, KCK said. Here are the highlights from fresh legislation conceived for the non-state of emergency period that outdoes the state of emergency. A Turkish court has ruled to keep in jail an American pastor being tried on terrorism and spying charges, a case which has deepened a rift between two NATO allies. The European Union should end accession negotiations with Turkey and pursue a different kind of cooperation with the country, Austrian Chancellor Sebastian Kurz told Kathimerini in an interview. The Democratic Society Movement (TEV-DEM) Diplomatic Relations Spokesperson wrote on his Twitter account that he has not had any meeting with the Syrian Presidential Political and Media Adviser. “If such a thing had happened, I underline that our administration would never hide it from the public opinion”. Southern Kurdistan youth movement organized a voluntary human shield action in the Qandil mountains since July 12. Twenty-two internationalists from France, Switzerland, Spain and Catalonia have come to participate in the resistance campaign. Our newspaper’s Ankara Representative Erdem Gül has been acquitted on the charge of obtaining and disclosing the state’s documents that require to be kept confidential on which he was prosecuted in relation to his reports on the ammunition-laden intelligence agency trucks. This year the Durham Miners Festival has been dedicated to Kurdish People’s Leader Abdullah Öcalan. The Durham Miners Festival, the largest labor festival in the world, is underway in Durham, participated by 200 thousand people. A new monthly report by the Office of the United Nations High Commissioner for Human Rights for June details large-scale rights abuses in areas under Turkish control, such as Afrin which was taken in March by Turkey from the Kurdish People’s Protection Units (YPG). “The further we drove into Raqqa, the worse the destruction became: most of the few buildings that are still intact have been taken over as command posts by the Syrian Democratic Forces (SDF), the Kurdish-Arab army that with the support of US-led airpower captured Raqqa after a four-month siege last October. There are equal numbers of Arabs and Kurds in the SDF, but the commanders we met were all Kurds” says Patrick Cockburn. A day before Erdoğan was sworn in, another 18,600 public servants were dismissed over alleged links to terror groups, and on Tuesday academics who had signed a petition calling for a peaceful resolution of the conflict with the Kurds were sentenced to prison. This year’s Durham Miners’ Gala was dedicated to the campaign to free Kurdish leader and political prisoner Abdullah Öcalan, and it helped to bring the progressive movement surrounding him into the mainstream. The message that the government wants to send is: we celebrate our victory through the intimidation and suppression of people, depriving them of basic rights, of the basis for a life in dignity. Turkey’s two-year-long state of emergency came to an end yesterday amid the introduction of a draft bill that seeks to bring about new anti-terror laws by the ruling Justice and Development Party (AKP). But opposition groups say the laws are as oppressive as the state of emergency. 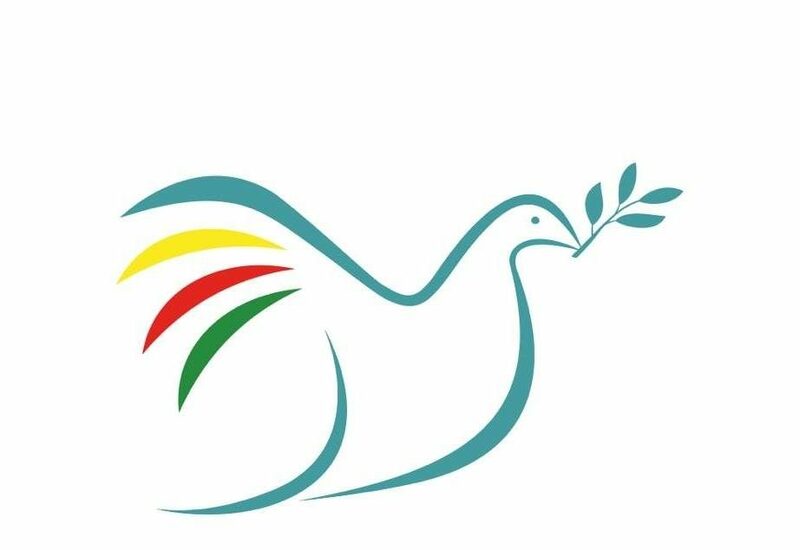 German Society for Threatened Peoples (Gesellschaft für bedrohte Völker, GfbV) published a press release about the alarming atrocities committed by the occupant Turkish army and allied mercenaries in Afrin. The interval of thirty days for detention review conducted while examining applications for release has been extended to ninety days. CHP Istanbul MP Sezgin Tanrıkulu has pointed out that this provision being made on detention review comes in the wake of Demirtaş’s damages suit that was concluded a day or two ago. The former presidential candidate and HDP’s co leader has been in Edirne prison since November 2016. There are more than 30 cases filed against Demirtaş mostly for the crime of insulting President Recep Tayyip Erdoğan or making propaganda for a terrorist organization via his public speeches. 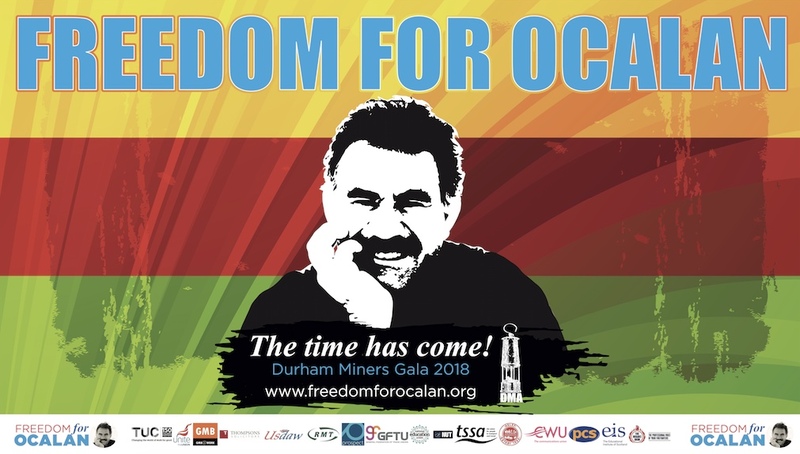 The 2018 Durham Miner’s Gala, the largest annual trade union festival in Europe, was dedicated to the Freedom For Öcalan trade union campaign, which is supported by 14 national trade unions, including the TUC, representing six million workers in the UK. Civilians now living in areas under the control of Turkish forces and affiliated armed groups (eg the Free Syrian Army) continue to face hardships, which in some instances may amount to violations of international humanitarian law and violations or abuses of international human rights law. Arriving at our first port of call we were confronted with a large military presence outside a tiny rural school, nestled amongst a few scattered houses. There were 2 armoured vehicles parked in the school grounds and dozens of soldiers and security guards both inside and outside the building. I could not go inside, the soldiers said so, and they were armed. Peace in Kurdistan Campaign facilitated a 6 person delegation to observe the Turkish election on 24 June 2018. The delegation was coordinated in response to a call from the HDP. Below are some of the responses written by delegates. For the first time, an international conference brought together Kurdish and European academics to speak about- and discuss their visions for a democratic solution to the crisis in the Middle East. Kurdish academics from all parts of Kurdistan and academics from several European universities and research institutions met for one day in Brussels, on 28 June.